Everyone is going "green" these days, and our schools are no exception. Greening our schools can be good for the environment, good for education and good for the bottom line, as well. If you are a fan of the TV show, Parenthood, you may recall Julia's Sustainability Committee duty. 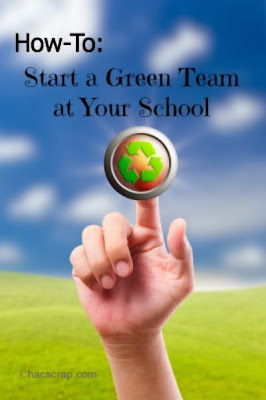 But if you don't already have a program in place, how can you suggest that your school get its own Green Team in the game? Start by asking your Parent-Teacher organization, they may welcome the opportunity for a new committee and new volunteers. Check with your administrators and be sure to get clearance for any projects or programs you want to start. Once you get the "green" light - you're all set. Now, the fun part begins. Your team can develop a mission or vision statement to set the tone and consider inviting teachers, staff and parents to participate on your team, as well. Decide if your team wants to set a few goals to get you started. For instance, you could start a recycle program, such as Terracycle in your lunchroom. Terracycle can be a great place for ideas and inspiration. We are getting started with this in our school district, and the team is focusing on three primary areas: Reducing Waste, Education and Grounds and Greening. Something to keep in mind, is that when you are just getting started, it takes time to learn how things are currently being done. Once you figure that out, your team can come up with a strategy to improve and green your processes. I keep my ideas on a Green Team Pinterest Board if you'd like to check them out. The possibilities are endless, from hosting a swap meet for clothes or toys to a clean up the grounds day, to planting a school garden to share with the community or lunchroom. All it takes is a little time and some volunteers to get started. And look around, there are grants and other programs available to help you out as well. Does your school have a Green Team? What are your initiatives for this school year?